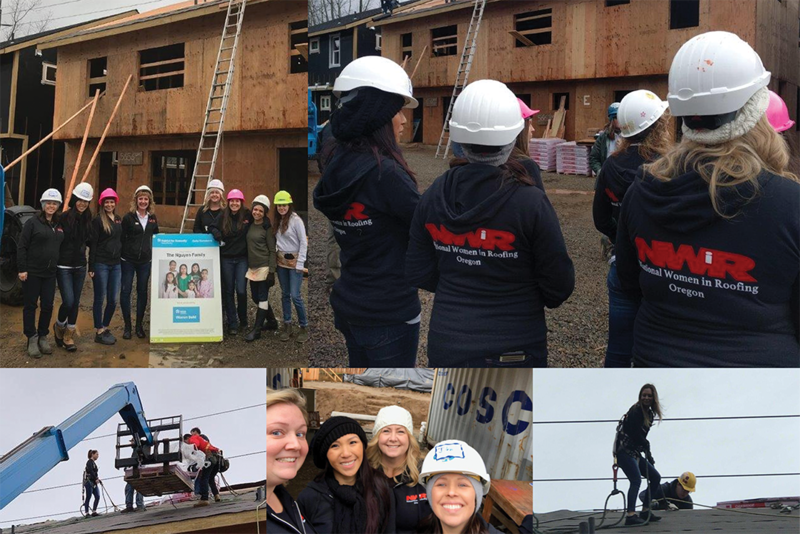 The National Women in Roofing Oregon Council recently participated in a Habitat for Humanity® Women's Build project at the Cully Build Site in Portland, Ore.
As part of its ongoing Neighborhood Revitalization initiative, Habitat for Humanity will build 15 new affordable homes in the diverse Cully neighborhood. In addition to NWiR Oregon Council volunteers, the following companies donated crews and materials to the project: NRCA member ABC Roofing Co., Clackamas, Ore.; NRCA member Bliss Roofing Inc., Clackamas; NRCA member CC&L Roofing Co., Portland; NRCA member Columbia Roofing and Sheet Metal, Tualatin, Ore.; Gibraltar Industries Inc., Milwaukee; NRCA member Interstate Roofing Inc., Portland; NRCA member Malarkey Roofing Products, Portland; NRCA member Matrix Roofing, Vancouver, Wash.; and Roofline Supply & Delivery, Clackamas. To submit a photo to Close-up, email professionalroofing@professionalroofing.net or mail a photo to Professional Roofing, Attn. : Close-up, 10255 W. Higgins Road, Suite 600, Rosemont, IL 60018. Submittals should include a photo, as well as a description about the photo. A $100 gift card will be awarded for the photo chosen.